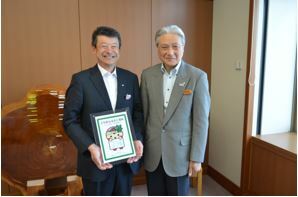 Tokyo, May 10, 2018 – Subaru Corporation has joined the Tochigi Furusato Denki program,*1 Japan’s first program for local production and local consumption of electricity launched by the Tochigi Prefecture Public Enterprise Bureau and TEPCO Energy Partner, Inc. Subaru was today presented with a certificate at the Tochigi prefectural government office recognizing its participation in the program. Companies participating in the program receive electric power generated by eight hydroelectric power plants owned by Tochigi prefecture that emit no CO2 during generation, which allow these companies to eliminate CO2 emissions associated with their electricity usage. Subaru adopted the program in the South Plant and 2nd South Plant of its Aerospace Company’s Utsunomiya manufacturing site in Utsunomiya City, Tochigi Prefecture. The supply of electric power to the plants started in April 2018. Subaru Environmental Policies,*2 which were revised in 2017, declare the company’s “efforts to reduce carbon-dioxide emissions in all of our operations.” Based on these policies, Subaru has positioned its participation in the Tochigi Furusato Denki program as part of efforts to reduce the Subaru Group’s direct CO2 emissions*3 to 30% below FYE2017 levels (on a total emissions volume basis) by FYE2031. Participation in the program is projected to reduce the Subaru Aerospace Company’s CO2 emissions by approximately 5,400 tonnes, equivalent to around 15% of its total annual CO2 emissions. Under the program, part of the electricity charges paid by Subaru will be used for environmental protection initiatives in Tochigi Prefecture. By joining the Tochigi Furusato Denki program, Subaru aims to contribute to creating a low-carbon society and promoting environmental protection initiatives in Tochigi where its Aerospace Company operates.